On July 5, 2017 I set out for my qualification of Green island WI062. A year ago I was successful in getting the island approved by USIsland Awards Program and received permission from the island owner “Roen Salvage Company”, Sturgeon Bay Wisconsin to conduct a ham radio operation from the island. I was not able however, to qualify the island that year. Prior to July 5th, the owner did approve again my intended visit but was somewhat hesitant because of liability reasons. He was comfortable with my promise to be unobtrusive and spend only a few hours there. The island is presently up for sale. Green Island is an uninhabited 87 acre island that lies 5 miles east of Marinette Wisconsin and 10 miles west from Egg Harbor and the Door County. The lighthouse was established in the 1860’s but is now in ruins. 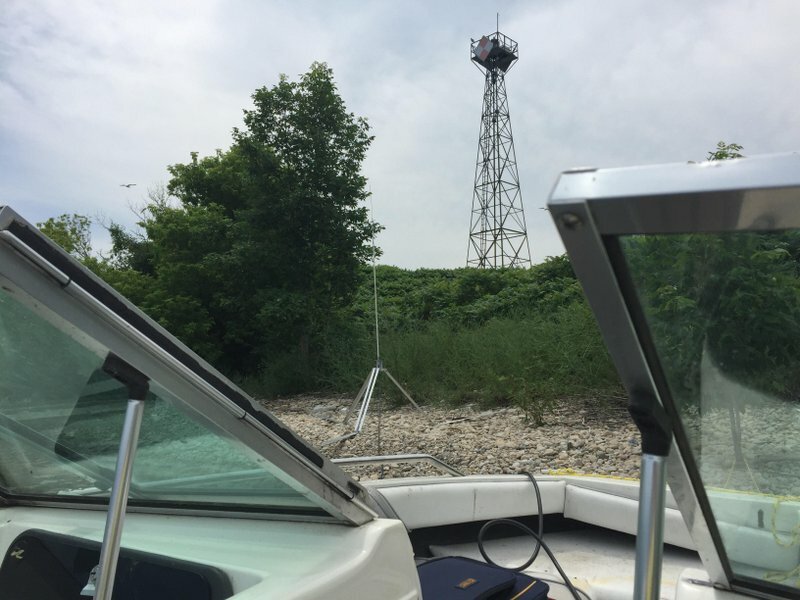 The newer light on a 65 foot tower is still active and operated by U.S. Coast Guard which sits on 2 acres of land at the south end of the island. There are no docking facilities or piers. 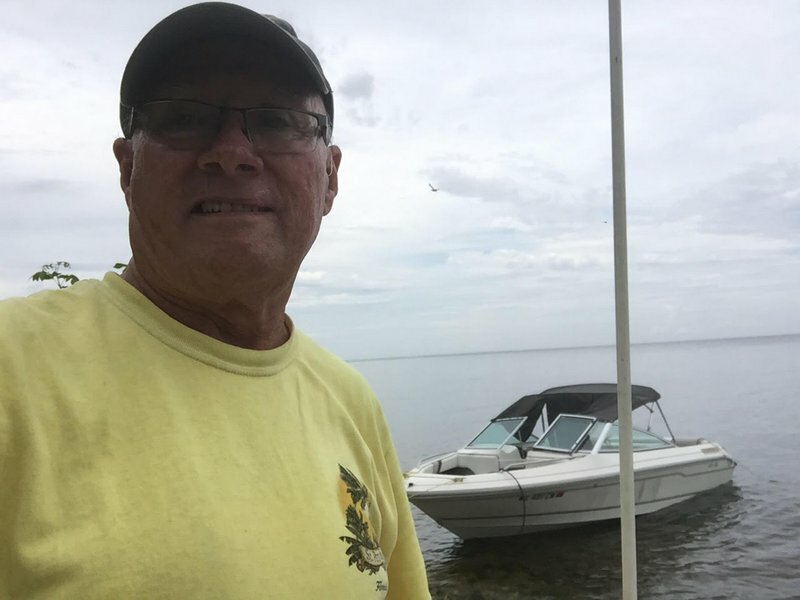 I launched my 17 foot boat at Egg Harbor heading west to the island unsure of how and where I might safely beach my boat. It took me about 35 minutes to reach the island and about 15 minutes to set up. 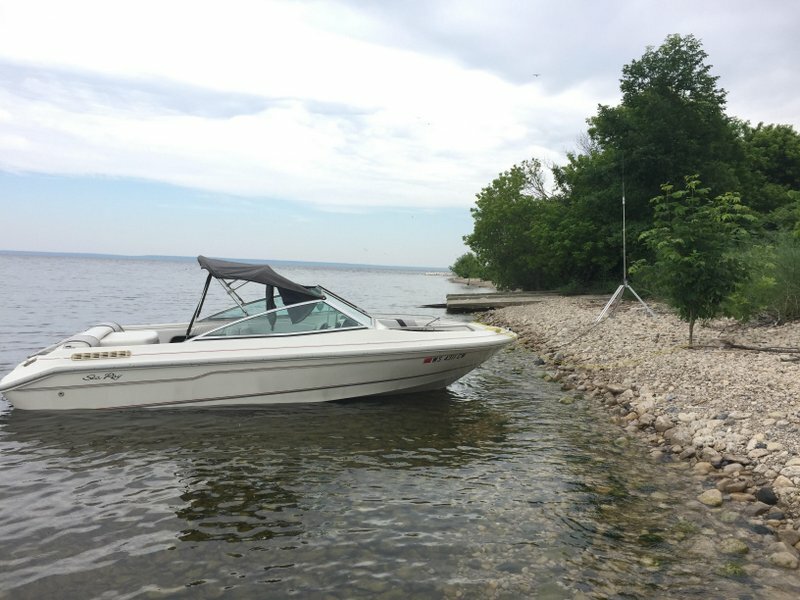 Once anchored, I erected my “Outpost” tripod using the “Hustler” mobile antenna and resonators for 20 and 40 meters. 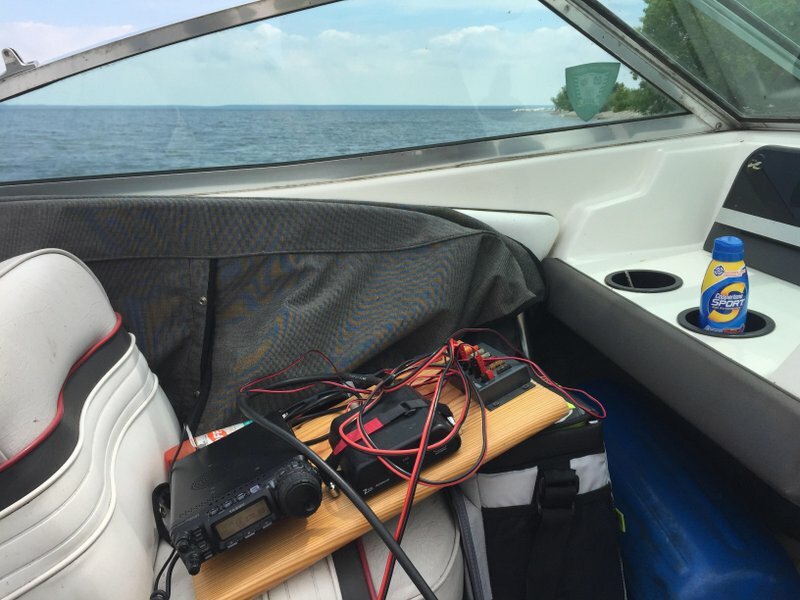 I ran RG 8U from the antenna thru some water unto my boat. My other equipment included my Yaesu FT 857D, LDG Z100 antenna tuner, Western Radio RigRunner 4005 and MFJ 4416C Battery Booster. My Power source was my faithful AGM battery..a boat anchor in itself. The obstacles included a rocky shoreline and beach, plenty of small biting flies and not great band conditions; however, good enough to get Green Island qualified with 34 contacts from the US and Canada, and also activating the old and new Green Island Lighthouses, USA-945 and USA-1437. The weather was hard to predict but turned out ok with light winds, 1 to 3 foot waves, 78 degrees F, mostly cloudy skies with light rain as I was leaving. I will well-remember when these waters freeze over this winter, this boating excursion and excitement in getting this island qualified, a goal I set 2 years ago.